A space station was originally envisioned as a structure in space that would act as a launching site for further human missions to the moon or Mars. The United States, after the successful Apollo missions to the moon, committed to establishing a piloted space laboratory orbiting the Earth. That space laboratory, Skylab, was manufactured on Earth and launched into orbit by Saturn rockets. Skylab was 58 feet long by 22 feet wide and weighed 169,950 pounds. Skylab 1 was launched in 1973, but was damaged during the flight, losing one of its solar panels and a meteoroid thermal shield which were later repaired by human-crewed missions repaired the station. The mission ended in 1974 but Skylab remained in orbit another five years before reentering the Earth’s atmosphere over the Indian Ocean and Western Australia in 1979. In 1971 the Soviets launched Salyut 1, the world’s first space station which was followed in 1973 by the United States’ Skylab. In 1986, the Soviets put the Mir Space Station in orbit which was the most successful space station until it was abandoned and burned up in the atmosphere in 2001. The International Space Station resulted from a cooperative effort of 16 countries with the US and Russia contributing most of the technology. 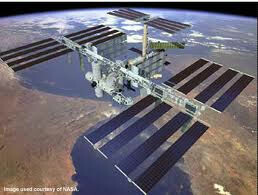 The first two parts of the International Space Station were launched in 1998. The satellite orbits more than 250 miles above the earth. International crews have been living there since 2000. The first crew consisted of one American and two Russian astronauts. International crews live aboard the satellite for months at a time performing various experiments and maintaining the facility. More on all of this later.